Chichester City’s 10 players held off Queens Park Rangers to take home the three points following a stunning first-half display in the FA Women’s National League. The Green Army took a 3-1 lead into the break thanks to goals from Hollie Wride, Jade Widdows and Cherelle Khassal, QPR’s Jo Wilson got a goal back on the stroke of half-time. It was a different tale in the second-half as the hosts grew and tried to take advantage when Widdows was carried off with 25 minutes left to play but they could only score a late second goal from Chantele Lawrence. Aaron Smith’s side headed into the game with the chance of leapfrogging Plymouth Argyle and Watford to move into second place. There were changes to the side again as new signing Nadine Bazan made her debut and Rebecca Bell got her first start while Jade Simmons, Gemma Simmonds, Khassal and Widdows returned to the starting line-up. Chi came out the blocks the quickest on the day and nearly scored with less than 30 seconds played but Khassal could only watch her shot cleared off the line. The home side were under pressure early on at the feet of the pacy frontline trio of Bell, Khassal and Widdows all of whom tested the defence but couldn’t get shots away. Wride grazed the crossbar from a 25-yard free-kick before Khassal was caught narrowly offside when Widdows put the ball over the defence. Chi broke the deadlock in the 12th minute through Wride. It was Bell with the cross into the box that fell neatly for Wride to loft a shot that hit the underside of the crossbar and went into the goal. Four minutes later Chi’s advantage was doubled through Widdows. QPR’s defence tried to clear their lines but could only head the ball through for Widdows to go one-on-one with the goalkeeper and neatly tuck away her second goal of the season. Widdows was denied again minutes later her shot blocked by the keeper’s legs. But in the 23rd minute, it was 3-0 for the visitors with Khassal volleying home at the near post from another Bell cross. Wride became the provider for Bell but saw her header cleared on the line before Lauren Cheshire had a shot comfortably saved by the QPR keeper. QPR began to grow into the game but didn’t do much to test Lauren Dolbear in the Chichester goal and Kasha Petit sent a shot over from long range. Khassal was denied late into the half as she forced the keeper into a great save with a well-struck shot. Wilson reduced the deficit volleying home from a few yards out on the stroke of half-time. It was a nervy start to the second 45 as QPR looked to capitalise from their goal before the break. The Chi defensive duo of Tiffany Taylor and Tammy Waine worked hard to recover well at the back and clear the ball. A double substitution was made for Chi with Tash Stephens coming on alongside the returning Helen Ogle, both having a quick impact to launch an attack but couldn’t force a shot. Elly Maggs lost her balance as she took aim before Chi quickly countered and Simmonds saw her 25-yard shot claimed well by the keeper. 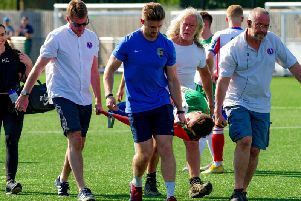 There was heartbreak in the 70th minute as goalscorer Widdows had to be carried off after picking up an ankle injury, meaning Chi would end the game with 10 players. With the player advantage, QPR looked for a way into the game but found a solid defence with Taylor blocking most of the crosses. Wride had another free-kick sail over the QPR goal with less than five minutes of normal time to go. In injury time Ogle had a great chance to put the game to bed but fired over. QPR did find a second goal but it was little too late as Lawrence curled a brilliant free-kick into the top corner in the 95th minute. Chichester breathed a sigh of relief as they remain unbeaten on the road and jumped up into second place as Coventry United comfortably beat Watford. Chi City Ladies: Dolbear, Cheshire (Ogle 56’), Taylor, Bazan (Capel-Watson 46’), Waine, Simmons, Wride, Bell (Stephens 56’), Simmonds, Khassal, Widdows. Unused sub: Lauren Clark.